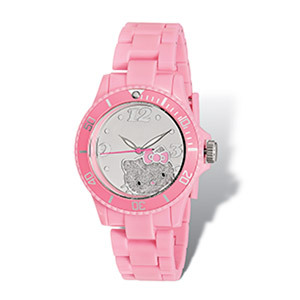 Watch, Hello Kitty®, acrylic and stainless steel, multicolored with silver-colored glitter, 19mm wide band with 40mm watch face and Hello Kitty face design, 8 inches. Sold individually. 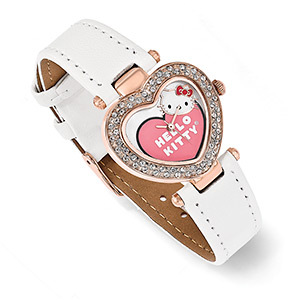 Watch, Hello Kitty®, mother-of-pearl shell (bleached) / crystal / imitation leather / stainless steel / rose gold-plated "pewter" (zinc-based alloy), multicolored, 16mm wide band with 29x26mm watch face and heart with Hello Kitty face design, 7 inches. Sold individually. 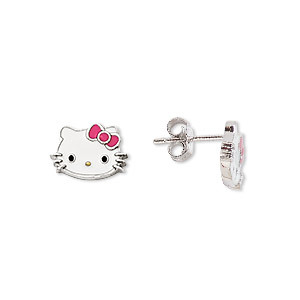 Earring, Hello Kitty®, enamel and sterling silver, white / pink / black, 11.5x8mm Hello Kitty face with post. Sold per pair. 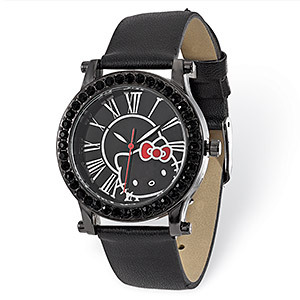 Watch, Hello Kitty®, faux leather / crystal / stainless steel / black-plated "pewter" (zinc-based alloy), multicolored, 17mm wide band with 36mm watch face and Hello Kitty face with Roman numerals, 8-1/4 inches. Sold individually. 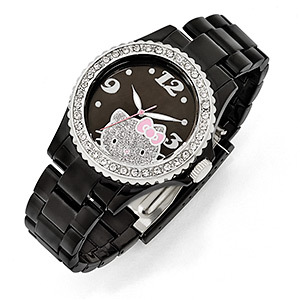 Watch, Hello Kitty®, acrylic / crystal / stainless steel, multicolored with silver-colored glitter, 19mm wide band with 40mm watch face and Hello Kitty face design, 8 inches. Sold individually. 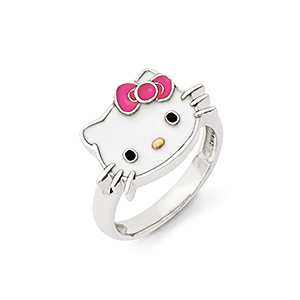 Ring, Hello Kitty®, enamel and sterling silver, multicolored, 14mm Hello Kitty face, size 8. Sold individually. 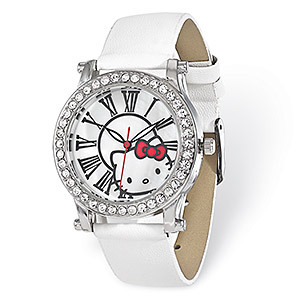 Watch, Hello Kitty®, faux leather / crystal / stainless steel / silver-plated "pewter" (zinc-based alloy), multicolored, 18mm wide band with 36mm watch face and Hello Kitty face with Roman numerals, 8-1/4 inches. Sold individually. 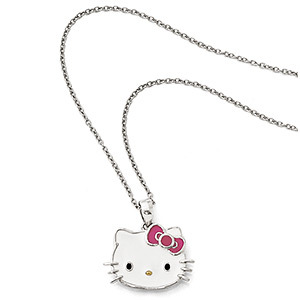 Necklace, Hello Kitty®, enamel and sterling silver, multicolored, 19x14mm Hello Kitty face, 18 inches with springring clasp. Sold individually.